The main system at the White Rock Community Park Splash Park has experienced a major malfunction which has resulted in the closure of the Splash Park’s water bucket features and slides. Unfortunately, that system will be down for the rest of the year. Despite this, the Splash Park’s ground features will remain open for the rest of the 2018 season with no entry fee. Staff will continue to adhere to the 90-person capacity. White Rock Splash Park hours through September 3: Saturdays & Sundays 11 a.m. – 1 p.m. and 2 – 5 p.m. Open Labor Day from 11 a.m. – 1 p.m. and 2 – 5 p.m. 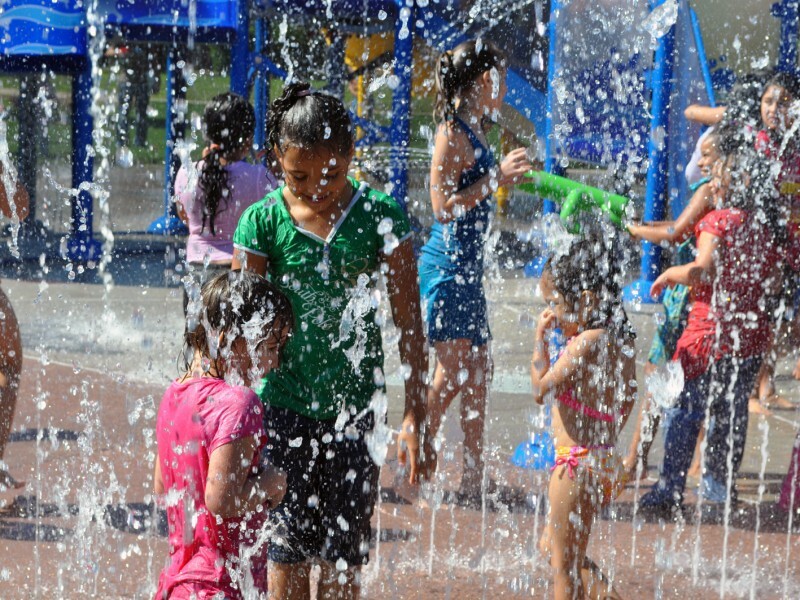 The Splash Park is closed from 1 – 2 p.m. for filtration. NOTICE: PLEASE APPLY SUNSCREEN (LOTION AND SPRAY) PRIOR TO YOUR ARRIVAL TO ALLOW TIME FOR ABSORPTION WHICH HELPS KEEPS OUR FILTERS CLEAN AND THE SPLASH PARK OPERATIONAL. IT ALSO MAXIMIZES THE BENEFITS OF SUNSCREEN. DUE TO NEW CAPACITY LIMITS, NO LARGE GROUPS OR PRIORITIZED RESERVATIONS WILL BE ACCEPTED. 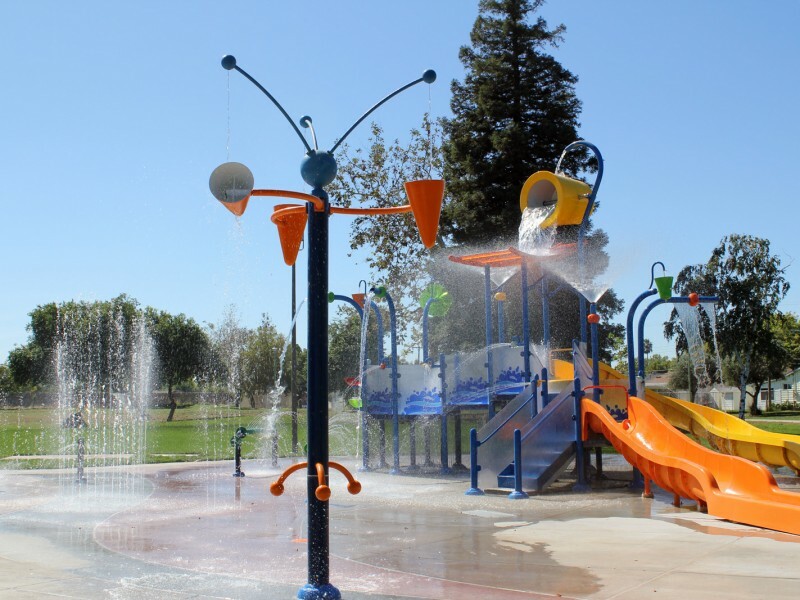 Located at White Rock Neighborhood Park, the splash park features a dump bucket, water slides, canons, water jets and other fun features to cool off in the hot summer months. The gated facility is one of the largest splash parks of its kind in Northern California. Children ages 6 and under must be accompanied by an adult. 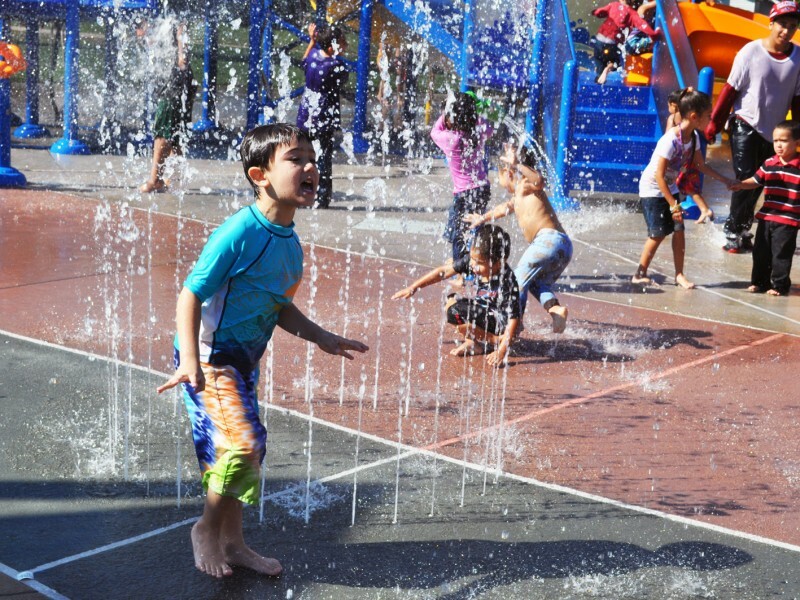 Have fun staying cool this summer at the dynamic and interactive splash park featuring a large dump bucket, waterslides, canons, water jets and much more. Due to OSHA requirements: to ride the small orange slide, riders must be at least 42” tall. To ride the longer, yellow slide, riders must be at least 46” tall. Height checks at entrance and measured without shoes. Children not tall enough for slides can enter for free and play in the spray areas. Maximum capacity is 90 people. No large groups or field trips. Session 1: 11 a.m. -1 p.m. Session 2: 2 – 5 p.m.
NO large groups or prioritized reservations will be accepted. *For the safety of all users, those wishing to ride the water slides need to meet minimum height requirements and purchase a wristband. State law requires that our lifeguards enforce height requirement rules. Wristbands help our lifeguards identify eligible riders. All other water features at the splash park are open to all users at no charge. For more information or call Hagan Community Center at 916-369-9844. Click here for White Rock Rules and Regulations Flyer 2017.